Regardless of the actual temperature, there’s something extra hot about the month of August. After two months of harsh temperatures and brutal sunburns, the last month of summer can leave you feeling hotter and more frustrated than ever before. This leads a lot of people reach farther for comfort and crank the temperatures on their thermostats waaaaaay down. There’s no need for that. 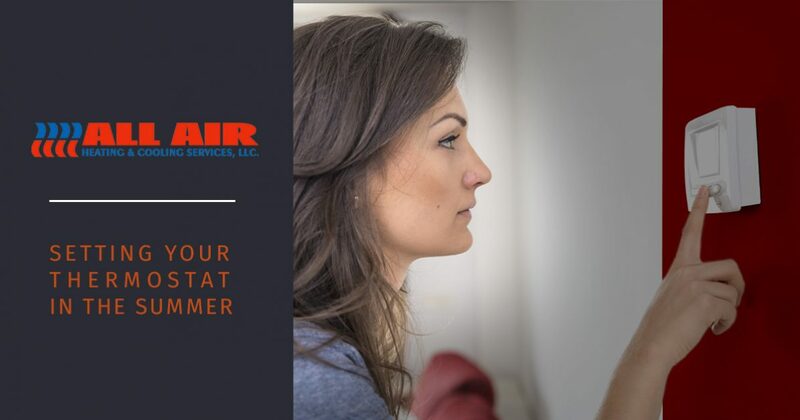 In this blog, the Fredericksburg air conditioning service specialists at All Air will give you a few tips for setting your thermostat during what feels like the hottest month of the year, and provide you with other tips to keep you and your house at a reasonable temperature until crispy, cool autumn comes around. Gradually raise your indoor temperature. We all love to crank our HVAC units down to 62 degrees to turn our homes into live-in refrigerators. However, this can burn a hole in your wallet when your energy bill comes in the mail. So how do we keep our energy costs down and stay comfortable? If you want to get used to energy savings, you must also get used to warmer temperatures in your home. No need to turn off your cold air cold turkey—start by gradually raising your thermostat’s temperature by a degree or two every day until your reach the 76-78 degree range. In order to achieve maximum energy savings, you’ll need to set your thermostat to a temperature that’s as close to the outdoor air temperature as possible. It might not be easy to deal with the warmer temperatures at first, but at least you won’t be sweating it when you get your energy bill. Technology has come a long way over the years. It wasn’t long ago that you’d come home from work to a scorching hot living room, only to blast your AC unit for a good hour just to get things back to a normal temperature. But those days are long gone—programmable thermostats can keep your home at the perfect temperature all day long, even when nobody is around. Investing in a programmable thermostat can be expensive at first, but it will pay for itself in energy savings. Just set your thermostat in the 80s around 9 a.m. when you’re at work so your HVAC unit is barely running, then set it to turn on that cool air 10 or 15 minutes before you get home from work. Once you get home, you’ll have the cool air you want, and an even cooler energy bill. It doesn’t matter how solid your thermostat strategy is—if your HVAC system isn’t running as efficiently as possible, you’re going to have a heftier energy bill than you would like. You need to get your HVAC serviced at least twice a year for maximum savings. That’s where All Air can help. With over 30 years in the heating and cooling business, we have the experience and the knowledge to keep your HVAC system in tip-top shape all year long. Book an appointment with All Air today!